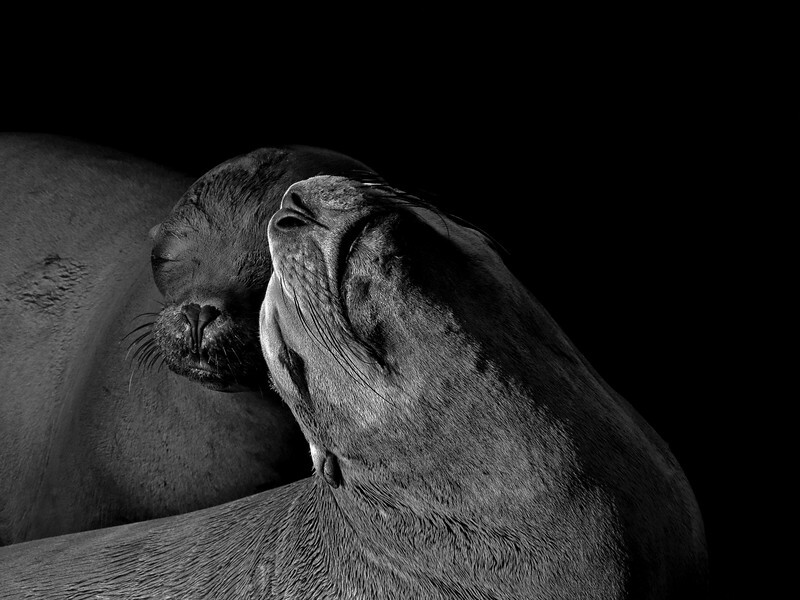 A favorite black & white conversion of a pair of sea lions basking in the sunlight. Side-lighting helped me achieve the effect I desired for this photograph. Wow!! Nice conversion and nice side lighting! Kudos to your light adjuster! Late afternoon pre-sunset lighting is so sweet. You might ask yourself whether you really need all that black negative space or could this image be better if the upper right corner were lowered and moved to the left just slightly? I really like this one. And I like the amount of negative space. Thanks for taking the time to look and comment. I greatly appreciate your suggestion and it would certainly work well for this image. Thank you for that! Thanks so very much, Denise. I always appreciate you taking the time to look and comment on my photographs! I love this one - wonderful lighting, composition and detail. Very sweet pose. Thanks so very much for looking and commenting! I like the negative space, but agree with @pathfinder that there's just a bit much of it. I love the texture and the anthropomorphic emotion I read into it. Very nice shot. Thanks for looking and commenting. I'm having a bit of good luck with this photo. I submitted it to a travel magazine and they posted it this morning on their Facebook, Twitter, and Instagram social media pages. WooHoo! Well heck! Don't listen to me about negative space then. That's awesome!